In 2006, someone sent me a link to a webcomic. Back then we shared links via email and the term webcomic carried the same sense of silly novelty as something like "3D printed shot glass" does today. The comic itself was very unassuming, with three crude stick figures and almost no coloring. The title of the comic in question is simply "Philosophy", and while it does have a certain charm to it, it wouldn't strike anyone as the type of thing that could go the distance. You can find the strip I'm referring to here. Over ten years later, Xkcd is one of the most famous mediums for popularizing science and Randall Munroe, the mind behind, is a science guru in the mould of Richard Feynman and Bill Nye. 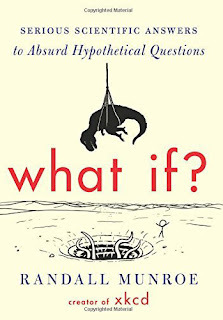 In recent years, Munroe has also written a science blog called What If? in addition to his triweekly comics. In it, readers ask absurd questions and Munroe tries his best to answer. The most recent answer (never mind the actual question) starts out: "So you want to give endangered whales powerful electric shocks. Great! I'm happy to help." What If?, the book version, is a collection of the most popular questions from the first few years of the blog and some excellent new ones. Have you ever wondered what would happen, if you threw a baseball at close to the speed of light? Or if there was a giant portal to space in the Mariana Trench? Chances are you haven't, but that doesn't detract from the supreme readability of Munroe's answers. The book is less intense with the actual calculations than the Internet version, but that also means it won't frighten away students of the humanities. Xkcd has always had a special place in my heart (and my head presumably). So it's no wonder that I absolutely loved What If?. Munroe has clearly found an audience that adores his humor and wit. To be honest, though, I have no idea how someone would react to it, if they were not familiar with its style. Somehow I feel it would be in everyone's interest to understand science more broadly than just what they teach you in school. Interest in the sciences seems to be declining just as we need it most. Answering frivolous hypothetical questions has never seemed this timely.